In this article, we will show you, How to write a C Program to Print Even Numbers from 1 to N using For Loop and While Loop. This program allows the user to enter the maximum limit value. And then, it is going to print the list of all even numbers from 1 to user entered value. Within this C Program to Print Even Numbers from 1 to N example, For Loop will make sure that the number is between 1 and maximum limit value. Any number that is divisible by 2 is even number. If condition will check whether the remainder of the number divided by 2 is exactly equal to 0 or not. If the condition is True then it is Even number, and the compiler will print i value. 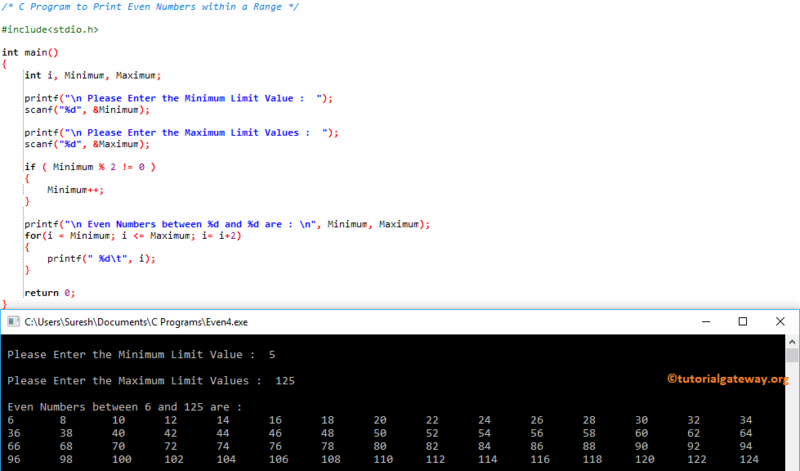 This program to Print Even Numbers from 1 to n in C is same as above but we altered for loop to eliminate the If statement. If you observe the below code snippet, We started i from 2 and increment it by 2 (not 1). It means, for the first iteration i will be 2, and for the second iteration i will be 4 (not 3) etc. This C program to Print Even Numbers from 1 to N is same as above. We just replaced the For Loop with While Loop. This program allows the user to enter Minimum and maximum value. Next, the C program will print the list of all even numbers between Minimum value and maximum value.